The Gravity Recovery and Interior Laboratory (GRAIL) mission by NASA has solved one of the moon's mysteries, its ever changing gravitational field. Mass concentrations under the lunar surface changes the gravitational field in the area that can either push or pull approaching spacecraft. 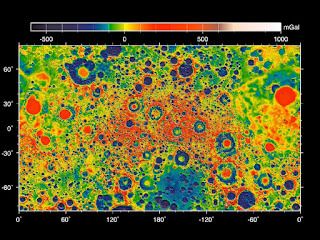 The GRAIL mission has mapped the gravity field of the lunar surface (see image). The image on the left, known as a Mercator projection (similar to Earth maps), represents the entire surface of the moon with the far side of the moon (the dark side) at the center of the map and the nearside (as seen from the Earth), on the left and right side. The red parts correspond to mass excesses which create areas of higher local gravity, and the blue parts correspond to mass deficits which create areas of lower local gravity. NASA's GRAIL mission involves two washing machine sized satellites that are placed on the same lunar orbit. It mapped the gravity of the lunar surface as well as its interior and thermal history. It also has a set of cameras known as MoonKAM that are used for NASA's education and public outreach project. A mystery of the moon that imperiled astronauts and spacecraft on lunar missions has been solved by a Purdue University-led team of scientists as part of NASA's GRAIL mission. Large concentrations of mass lurk on the lunar surface hidden like coral reefs beneath the ocean waves - an unseen and devastating hazard. These concentrations change the gravity field and can either pull a spacecraft in or push it off course, sealing its fate to a crash on the face of the moon. "In 1968 these mass concentrations were an unwelcome discovery as scientists prepared for the Apollo landings, and they have remained a mystery ever since," said Jay Melosh, a member of the Gravity Recovery and Interior Laboratory, or GRAIL, science team who led the research. "GRAIL has now mapped where they lay, and we have a much better understanding of how they developed. If we return to the moon, we can now navigate with great precision." A better understanding of these features also adds clues to the moon's origin and evolution and will be useful in studying other planets where mass concentrations also are known to exist including Mars and Mercury, said Melosh, who is a distinguished professor of earth, atmospheric and planetary sciences and physics. "We now know the ancient moon must have been much hotter than it is now and the crust thinner than we thought," he said. "For the first time we can figure out what size asteroids hit the moon by looking at the basins left behind and the gravity signature of the areas. We now have tools to figure out more about the heavy asteroid bombardment and what the ancient Earth may have faced." The team confirmed the standing theory that the concentrations of mass were caused by massive asteroid impacts billions of years ago and determined how these impacts changed the density of material on the moon's surface and, in turn, its gravity field. A paper detailing the results will be published online by the journal Science on Thursday (May 30). In addition to Melosh, Purdue team members include Andrew Freed, associate professor of earth, atmospheric and planetary sciences, and graduate students Brandon Johnson and David Blair. Additional team members include Maria Zuber, GRAIL principal investigator and professor at the Massachusetts Institute of Technology; J. Andrews-Hanna of the Colorado School of Mines; S. Solomon of Columbia University; and the GRAIL Science Team. "The explanation of mascons has eluded scientists for decades," Zuber said. "Since their initial discovery they have also been observed on Mars and Mercury, and by understanding their formation on the moon we have greatly advanced knowledge of how major impacts modified planetary crusts." Jay Melosh, a Purdue distinguished professor of Earth, atmospheric and planetary sciences, stands in front of a map showing the moon's gravity field. As a member of the science team of NASA's Gravity Recovery and Interior Laboratory, or GRAIL, mission, Melosh led a study of large concentrations of mass beneath the lunar surface. The team confirmed that the mass concentrations, or "mascons," were caused by massive asteroid impacts billions of year ago and determined how these impacts changed the density of material on the moon's surface and, in turn, its gravity field. The mass concentrations form a target pattern with a gravity surplus at the bulls-eye surrounded by a ring of gravity deficit and an outer ring of gravity surplus. The team found that this pattern arises as a natural consequence of crater excavation, collapse and cooling following an impact. The team determined that the increase in density and gravitational pull at the bulls-eye was caused by lunar material melted from the heat of the asteroid impact. The melting causes the material to become more concentrated, stronger and denser, and pulls in additional material from the surrounding areas, Melosh said. The large asteroid impacts also caused big holes into which the surrounding lunar material collapsed. As the cool, strong lunar crust slid into the holes it bent downward, forming a rigid, curved edge that held down the material beneath it and prevented it from fully rebounding to its original surface height. This causes a ring with less gravitational pull because the mass is held farther below the surface, the top of which is what most influences the gravitational signature, he said. The outer ring of increased gravitational pull comes from the added mass of the material ejected by the initial impact that then piles on top of the lunar surface. The team combined expertise in specialized computer analysis methods called hydrocodes and finite element codes to create computer simulations that could show the physical changes occurring from microseconds to millions of years. The team analyzed the Freundlich-Sharanov and Humorum mascon basins. Melosh is a pioneer in adapting computer hydrocodes - computer programs originally created to analyze the flow of liquids - to simulate how complex materials move when high-speed collisions occur, like that of a planetary collision. Hydrocodes can be used to study such phenomena on a time scale of microseconds to hours, but are not practical from time scales much longer than that, he said. Freed is a leader in adapting finite element codes, like those used to study car crashes, to simulate the changes in density of complex materials upon cooling and the evolution of Earth and other planets on the time scale of hours to millions of years. Using the GRAIL data set, which offers an unprecedented, detailed map of the distribution of masses in the moon, the team was able to put together a picture of how the moon's crust and mantle behaved and the development of the concentrations of mass in the aftermath of large asteroid impacts. During their prime and extended missions, the two GRAIL spacecraft transmitted radio signals precisely defining the rate of change of distance between them. The distance between the crafts Ebb and Flow changed slightly as they flew over areas of greater and lesser gravity caused by visible features, such as mountains and craters, and by masses hidden beneath the lunar surface. GRAIL scientists are using this data to learn detailed information about the moon's internal structure and composition.